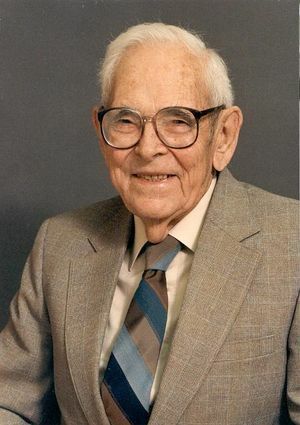 Archie W. Straiton was born 27 August 1907 at Arlington, Texas. He received the degrees of B.S. in E.E., M.A. in Physics, and the Ph.D. in Physics from The University of Texas at Austin in 1929, 1931, and 1939 respectively. From 1931 to 1943, he taught at Texas A. & I. University at Kingsville, and in 1943 he joined the faculty of The University of Texas at Austin. He served as Chairman of the Electrical Engineering Department from 1966 to 1971 and as Acting Dean of the Graduate School and Vice-President from 1972 to 1973. He became Emeritus in 1989. In 1945, Straiton helped establish the Electrical Engineering Research Laboratory within the University and was its Director from 1947 to 1972. This organization conducted research on many aspects of the propagation of radio waves through the atmosphere including horizon and vertical refraction of microwaves, sea surface ducting, television coverage, atmospheric refractometry and geomagnetics. In 1951, he and Charles W. Tolbert started a comprehensive study of the transmission characteristics of millimeter radio waves. They measured atmospheric attenuation from eight millimeters to one millimeter (as sources could be obtained or improvised) in the laboratory and over a wide variety of outdoor paths including transmission from Pikes Peak to Mount Evens in Colorado. Measurement of the radiation from the sun, moon, planets and satellites revealed transmission properties of the entire atmosphere and provided data on some of the components of the solar system. One of high precision antenna systems permitted the reception of the first intercontinental microwave moon bounce from Malvern, England in 1958. A five meter parabolic antenna system was later used extensively by astronomers for the measurement of interstellar gases. Straiton received the Presidential Citation from The University of Texas in 1982 and the Distinguished Engineering Graduate Award in 1984. He was Regional Director of the Institute of Radio Engineers in 1953 and 1954. He was a three term member of the USA National Committee of the International Radio Engineers and was Chairman of its Commission 11 for one-three year term. He attended seven URSI International Conventions as a USA delegate. He is a Fellow of the Institute of Electrical and Electronic Engineers and a member of the National Academy of Engineering. 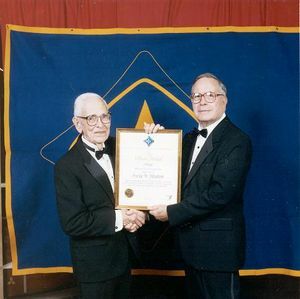 He was awarded the IEEE Edison Medal in 1990 "For an outstanding career in electrical engineering with significant contributions in the fields of radio propagation and astronomy, and in engineering education." He married Esther McDonald in 1932. they had two daughters, Janelle Holman and Carolyn Erlinger, six grandchildren and three great grandchildren. Straiton passed away on 22 July 2000. This page was last edited on 18 January 2016, at 17:22.